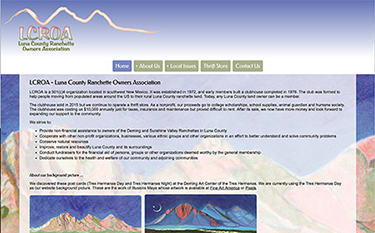 LCROA is a 501(c)4 organization located in southwest New Mexico, established in 1972 to help people moving from populated areas around the US to their rural Luna County ranchette land. Today, any Luna County land owner can be a member. The organization continues to operate a thrift store and other projects with proceeds going to college scholarships, school supplies, animal guardian and humane society. They wanted to update a very out of date website and establish a facebook presence to expand their outreach. Visitors can now visit them using computer, tablets, or smart phones and make comments on their Facebook page. If your organization has similar needs, please contact us.